Analysis: Flacco practiced in full all week, so the active status was expected. However, with Jackson having forged a 3-1 record as a starter, he'll remain in the top job against a vulnerable Tampa defense in Week 15. Flacco's active status knocks Robert Griffin III back to an inactive designation. 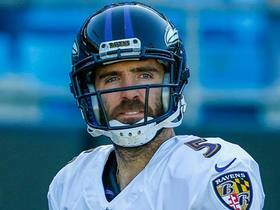 The Ravens list Flacco (right hip) as questionable for Sunday's game against the Buccaneers. Analysis: Flacco was listed as a full practice participant all week, so he'll presumably be available this weekend. In any case, assuming he's in uniform Sunday, he's be in line to back up Lamar Jackson, who has been confirmed as the Ravens' Week 15 starting QB. Coach John Harbaugh said that Flacco (hip) would practice fully Wednesday and will face no restrictions as he returns to action in a backup role Sunday against the Buccaneers, Eduardo A. Encina of the Tampa Bay Times reports. Coach John Harbaugh said Flacco (hip) would serve as the backup to Lamar Jackson (ankle) in Sunday's game against the Buccaneers, Jamison Hensley of ESPN.com reports. Coach John Harbaugh suggested Flacco (hip) will have a role Week 15 against Tampa Bay, Jeff Zrebiec of The Athletic reports. 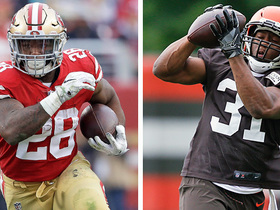 "It stands to reason that if Joe's ready to go, he'll be part of the game plan," Harbaugh said Monday. "He's too good of a player not to be." Flacco (hip) is inactive for Sunday's game against the Chiefs, Jamison Hensley of ESPN.com reports. Flacco, who is listed as questionable for Sunday's game against the Chiefs, is dealing with a small tear in his right hip but is rapidly approaching full health, Ian Rapoport of NFL Network reports. Flacco (hip) is listed as questionable for Sunday's game in Kansas City. Flacco (hip) practiced fully Friday but has yet to receive medical clearance for game action, though that could happen prior to Sunday's contest in Kansas City, Jeff Zrebiec of The Athletic reports. 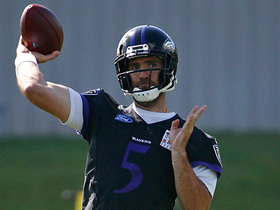 Flacco (hip) practiced Friday for the third straight day, Jamison Hensley of ESPN.com reports. Analysis: Flacco was able to practice all three days this week for the first time since injuring his hip in Week 9, but the report notes the quarterback still "appears to have a slight hitch when he moves around." Hensley's tidbit suggests Flacco may not be ready to play this weekend against the Chiefs, offering further fuel to the notion that Lamar Jackson will remain under center for the Ravens. An official update on Flacco's status for Sunday will come after Friday's practice concludes. 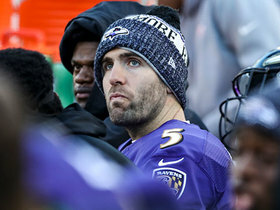 Flacco (hip) displayed improved mobility during Wednesday's practice, but Lamar Jackson is expected to get another Sunday in Kansas City, Jamison Hensley of ESPN.com reports. Coach John Harbaugh said that Flacco (hip) would be a limited participant in Wednesday's practice, though it's expected the quarterback will increase his workload relative to what he was able to do last week, Jeff Zrebiec of The Athletic reports. Flacco (hip) will increase his practice workload in the coming days, with a decision on medical clearance likely waiting until the end of the week, Jamison Hensley of ESPN.com reports. Flacco (hip) is inactive for Sunday's game against the Falcons. Analysis: As a result, Lamar Jackson will draw another start at QB for the Ravens on Sunday, with Robert Griffin set to back him up. The Ravens list Flacco (hip) as doubtful for Sunday's game against the Falcons. Flacco (hip) practiced Friday for the second straight day, Jamison Hensley of ESPN.com reports. Analysis: While Flacco was able to get some work in Friday, the report indicates he is "clearly not at full strength" and "limped while walking onto the practice field." As such, he could be ready to return to action at some point in the near future, but it appears as though he's trending toward a third straight absence Sunday against the Falcons. Flacco participated in practice Thursday for the first time since injuring his hip Nov. 4, Jamison Hensley of ESPN.com reports. Analysis: Hensley notes that Flacco was limited in his participation Thursday, adding that Lamar Jackson is still considered the favorite to start at QB for the Ravens this weekend against Atlanta. For his part, Jeff Zrebiec of The Athletic doesn't see Flacco as a likely "option for Sunday, but he could certainly factor in next week's decision depending on what (the) Ravens do Sunday against Falcons and how Jackson plays." Flacco (hip) isn't practicing Wednesday, Jamison Hensley of ESPN.com reports. Coach John Harbaugh suggested Monday that Flacco (hip) could eventually split snaps with Lamar Jackson, Jamison Hensley of ESPN.com reports. Flacco (hip) hasn't been cleared to practice and is expected to see a hip specialist this week, ESPN.com's Jamison Hensley reports. Flacco (hip) plans to return to practice Tuesday, a source told Jason La Canfora of CBS Sports. Flacco (hip) has been ruled out for Sunday's game against the Raiders, Jamison Hensley of ESPN.com reports. Analysis: It's interesting to see Flacco officially ruled out after he was listed as 'doubtful' the previous week. It may be related to the matchup rather than indicative of a setback, considering the Ravens faced a potential playoff team (Cincinnati) last week and will now play host to the woeful Raiders. Whatever the case, Lamar Jackson is set to make another start as the centerpiece of a run-heavy game plan, while Flacco will hope to return Week 13 in Atlanta. Flacco (hip) did not take part in Friday's practice, Jeff Zrebiec of The Athletic reports. Analysis: Flacco did not practice at all this week and has not gotten any work in since Week 9, so it's likely he will sit out Sunday for the second straight week. That puts Lamar Jackson in line to remain under center for the Ravens' matchup with the Raiders. Flacco (hip) didn't practice Thursday, Jeff Zrebiec of The Athletic reports. Analysis: We'll revisit Flacco's status Friday, but at this stage it's looking like Lamar Jackson will probably draw another start at QB for the Ravens in Sunday's game against the Raiders. Flacco (hip) didn't practice Wednesday, Jamison Hensley of ESPN.com reports. Analysis: Coach John Harbaugh said Flacco would have a shot to return for Sunday's game against Oakland, though the soft matchup points toward a cautious approach. The Ravens seem to be headed for another week with Lamar Jackson at quarterback, but the prognosis could change if Flacco returns to practice Thursday or Friday. Coach John Harbaugh relayed after Sunday's 24-21 win over the Bengals that it might be tough for Flacco (hip) to play next weekend against the Raiders, Jeff Zrebiec of The Athletic reports. Analysis: Of course, there's less urgency to get Flacco back on the field following the effort of Lamar Jackson in his first NFL start Sunday. In addition to completing 13 of 19 passes for 150 yards (with a pick), Jackson helped spark the Baltimore offense by running for 117 yards on 27 carries. Flacco (hip) is inactive for Sunday's game against the Bengals. Analysis: With Flacco out, 2018 first-rounder Lamar Jackson is in line to start at QB for the Ravens on Sunday, while backup Robert Griffin is a candidate to see the field in certain situations. Looking ahead, ESPN's Jamison Hensley relays that Flacco will not require surgery to address his hip issue. Additionally, though the veteran signal-caller could also potentially sit out next week's contest against the Raiders, Flacco is not expected to miss time beyond that. 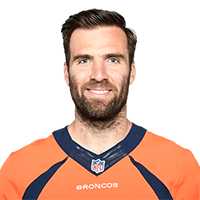 Flacco, who is listed as doubtful for Sunday's game against the Bengals and is highly unlikely to play, isn't expected to require surgery to address his right hip injury, Tom Pelissero and Ian Rapoport of NFL Network report. Flacco (hip), who is listed as doubtful for Sunday's game against the Bengals, isn't expected to play, a source told Adam Schefter of ESPN. The Ravens are listing Flacco (hip) as doubtful for Sunday's game against the Bengals, Jeff Zrebiec of The Athletic reports. Flacco (hip) didn't take part in Friday's practice, Jeff Zrebiec of The Athletic reports. Analysis: Unless Flacco gets some work in behind the scenes Friday, he'll have gone the entire week without taking any practice reps. Coach John Harbaugh said earlier in the week that Flacco could still play Sunday against the Bengals even if he doesn't practice beforehand, but the chances of that actually happening seem minimal. If Flacco is in fact ruled out this week, either Lamar Jackson or Robert Griffin would get his first start of 2018. Flacco (right hip) was not spotted at Thursday's practice, Jeff Zrebiec of The Athletic reports. Flacco (hip) isn't participating in Wednesday's practice, Jamison Hensley of ESPN.com reports. Flacco (hip) is still getting treatment and will start Sunday's game against the Bengals if he is healthy enough to play, Jamison Hensley of ESPN.com reports. Flacco was recently spotted in the Baltimore area using crutches while he contends with a hip injury, but the Ravens view him as day-to-day rather than week-to-week heading into their next game Nov. 18 against the Bengals, Ian Rapoport of NFL Network reports. Flacco is seeking medical opinions for a hip injury, with surgery and prolonged rest considered two of the options for treatment, Jason La Canfora of CBS Sports reports. Coach John Harbaugh suggested Flacco will continue to start at quarterback after a Week 10 bye, Jeff Zrebiec of The Athletic reports. 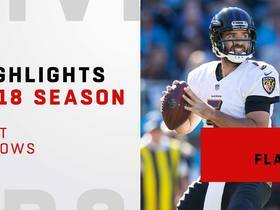 Analysis: Flacco had been enjoying one of his better seasons prior to his struggles the past two weeks in losses to Carolina and Pittsburgh. The Ravens aren't quite ready to make the switch to Lamar Jackson, but they could reassess if they fall out of the wild-card race in the AFC. A home loss to Cincinnati in Week 11 would put the team in an awfully tough position. Flacco completed 23 of 37 passes for 206 yards without a touchdown or turnover in Sunday's 23-16 loss to the Steelers. Analysis: Flacco took a major step back in his home meeting with this AFC North rival after throwing for 363 yards and two touchdowns when these teams met in Pittsburgh in Week 4. The veteran quarterback has come back down to earth after a hot start, posting a 4:4 TD:INT over the past five weeks after opening with an 8:2 mark in the first four games. 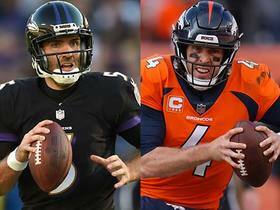 Flacco will hope to recapture that strong early-season form following Baltimore's Week 10 bye. 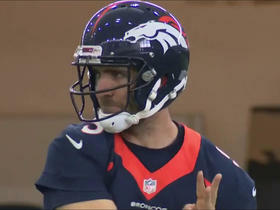 Watch to see quarterback Joe Flacco practice with Denver Broncos. 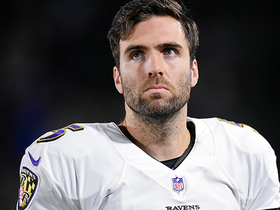 NFL Network's Willie McGinest and LaDainian Tomlinson weigh in on whether Baltimore Ravens QB Joe Flacco is in danger of losing his job in the near future. Denver Broncos quarterback Joe Flacco explains how his offseason unfolded, landing in Denver. NFL Network Insider Ian Rapoport reports on the Baltimore Ravens' decision to trade quarterback Joe Flacco to the Denver Broncos once the league year begins in March. Watch Baltimore Ravens quarterback Joe Flacco's best throws from the 2018 season. NFL Network's Mike Garafolo discusses how the trade of Baltimore Ravens QB Joe Flacco to the Denver Broncos impacts the rest of the QB market, including Philadelphia Eagles QB Nick Foles. NFL Network Insider Ian Rapoport reports on the future of Baltimore Ravens quarterback Joe Flacco. 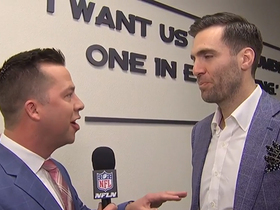 NFL Network Insider Ian Rapoport has the latest on the future of Baltimore Ravens quarterback Joe Flacco.